I drove up to Zanesville for the photo shoot this week. The weather was not ideal but at least I didn't get snowed out like last year. The printer delivered the Spring issue while I was there. It turned out very nicely. I'm glad my students are getting back to knitting their swatches. I've been receiving quite a few lessons to review. Again, when you send your lesson, if you think of it, send me an email that it is on its way and include a tracking number. This week's topic is about lifted increases. Over the years I've noticed that lots of knitters have problems with these and they generally make one of two mistakes. The video I've done shows how NOT to make them. In the photograph I have three sets of lifted increases. The ones with the red arrows are correct. 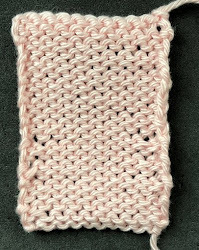 When you make a lifted increase you use the leg of the stitch below. If you use the right leg, the increase seems to slant towards the right and if you use the left leg, it slants towards the left. The pair indicated with the yellow arrows show a common error. If you insert your needle into the center of the stitch below, this is what it looks like. There is a big hole at the base. After looking at these, I might actually considering doing this on a project. They are rather decorative. The purple arrows show the most common error I see in the lessons. Most knitters are hardwired to ALWAYS work stitches through the front and depending on how you lift the stitch leg and put it on your needle, you might twist the loop if you knit it through the front. These sort of look like M1 increases except they are bulky as they twist the leg of the stitch below rather than use the horizontal bar between. To see how NOT to make the lifted increases, watch this video: The wrong way to make lifted increases. By the way, if you'd discovered another wrong method, let me know. I didn't think I'd finish the lacy dress but I did. I took some photos at the photo shoot. The dress looked wonderful on the model. Here is the lacy dress....It is too bad the photo can't show how well it moves. It really is lighter than air. Really helpful distinction on the lifted increases. Thanks.